The Pearl 695E Dolce flute offers the advancing student or serious amateur flautist a beautifully rich, yet solid tone with excellent mechanics. This hand-finished instrument would be ideal as an upgrade flute, due to the improved tonal depth and interest provided by the precious metal silver head joint. Has a Forza head joint. Pearl’s Dolce series flutes are built in the same moulds as the professional 795 Elegante instruments, and expertly demonstrate Pearl’s commitment to accuracy of pitch and flexible articulation. The key work is made from a heavier gauge metal and is more finely sculpted than Pearl’s student and 665 Quantz series. Also, the Forza head joint produces unbelievable projection combined with a dazzling rich tone. 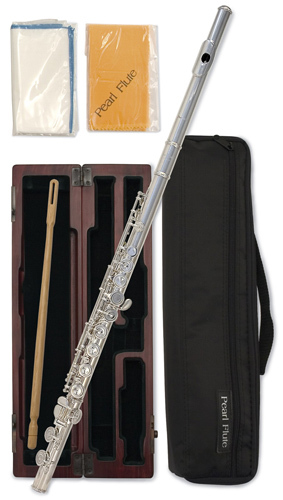 This flute comes with an elegant French style wooden case, plush-lined case cover with shoulder strap, cleaning rod and several cleaning cloths.